NYE and the Christmas party season may be over but adding a bit of sparkle and glitter to an outfit can transform your look taking you from office to bar. It can also just brighten up an otherwise dreary outfit. January is renown for being the most depressing time of year especially in England when the weather is particularly miserable! I enjoy wearing sparkly nail polish so that whenever I am low I can admire my lovely sparkly nails! I also have this giant gold glittery jumper which is too many sizes too big but I love to bits because its all sparkly and glittery! Remember glitter isn't just for Christmas its for life!!! 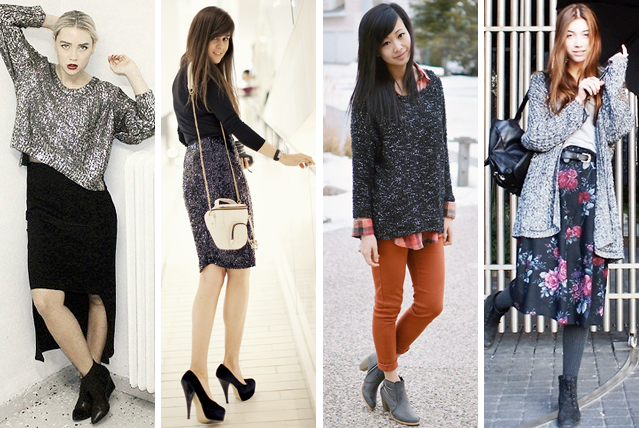 Below are some lookbookers who add just the right amount of sparkle to their everyday outfits. Oh, that collar is lovely! I think I'm having a little detachable collar obsession at the moment. I've seen the detachable collar in stores lately, kind of tempted to get it! grate post! I love the asos, however i'm truing to not to spend any money as a new year's resolution. I want some glitter in my closet. What amazing picks! I'm in love with all things glittery right now. seriously adorable photos. i loveeeeeee sparkles!